There’s something about a fresh coat of paint, or a new car, or even a clean desk. It’s more than just the novelty – it makes you feel good and actually is proven to motivate you and be more creative. 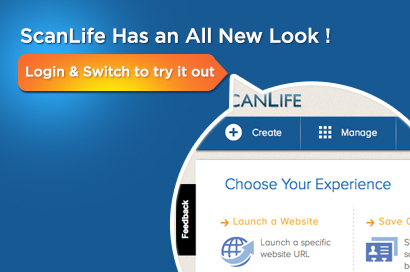 So it was for that reason (and many others) that we decided it was time to do a complete redesign of the ScanLife platform. Today marks the first debut of that work which you can now view from your ScanLife account. Since 2007, when we launched the platform, we have added tons of great features – but over time some of them have become harder and harder to appreciate, or even find. Plus, we have grown. 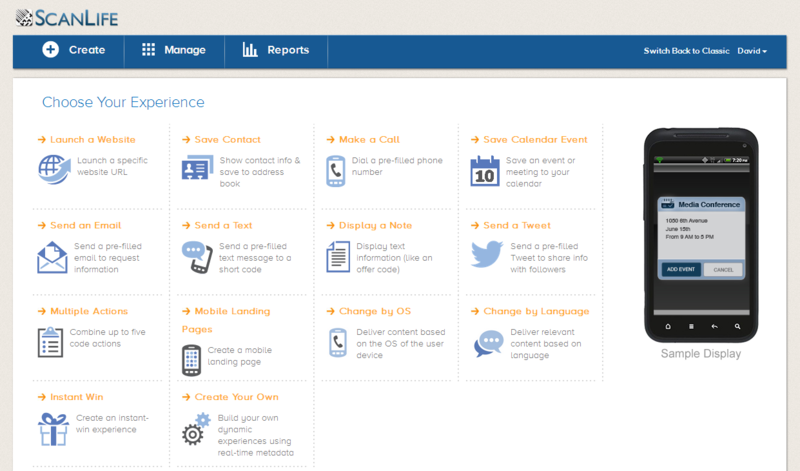 We are now powering mobile campaigns for 25% of the Fortune 100 and hundreds of small businesses around the world. Your needs have evolved over the past couple years from simply generating a QR Code with a web page to a robust platform that can create and analyze mobile experiences triggered by a variety of media and technologies. 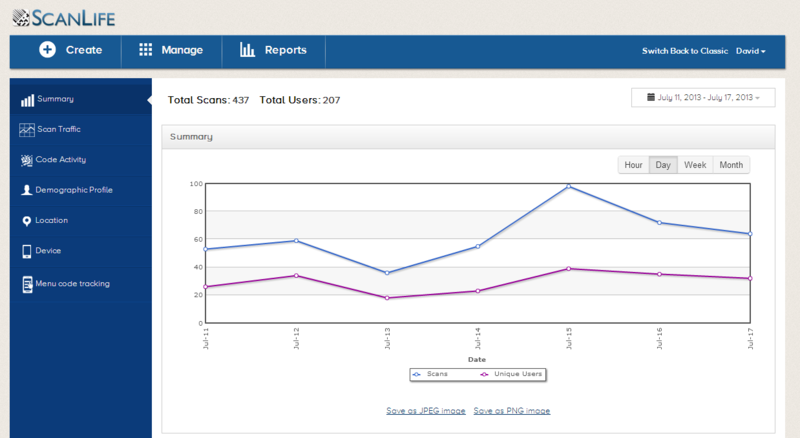 It is with these insights that we have developed the redesigned ScanLife. ScanLife offers over 15 possible actions you can create and launch from the platform. This is really the most vital area of the platform, so now we have dedicated a page that lays it all out in more detail and explains how they can be used effectively. Creating that experience should also be simpler and faster. Today’s mobile world is extremely diverse, so we have made it easier for you to publish your experience wherever you want. 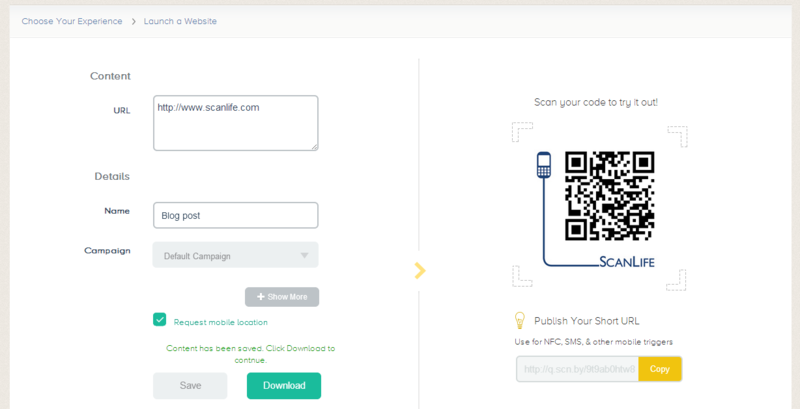 2D barcodes like QR Codes are just one possibility, but now you can easily take the ScanLife URL and use it in NFC, mobile banners, and more. All of the traffic is viewable in the analytics dashboard so you can see all of the activity at once. We will be the first to say that the current design was due for an update. Apple knew it was time for an update with their recent announcement of iOS7 and our goals are very similar – keep the design simple to help you complete the task that is most critical at that moment. The new version uses a modern flat UI and the system was rebuilt using modern web design with HTML 5 and Bootstrap inspired CSS framework. While most do not access the platform from a Smartphone, many do from a tablet and this new design will make it easier for you to do so. While huge sections of the platform are part of this release, it is just the beginning. Some features you may be accustomed to are not yet there, but we certainly plan to bring them back in the near future – with improvements of course. This is an ongoing effort and we will be updating on a regular basis over the coming couple months, so please check out the “release notes” link at the top of the page. In the mean time, you have easy access to the current (or “Classic”) UI for any of the features you are missing. Just click the orange “New Look” button at the top right to switch over after you login. Everything you do in the new version is fully functional. So if you wanted to create a new experience, you can do that and it will work as usual. Plus, anything you do on the new version is available in the “Classic” version (it’s just like a mirror). If you don’t see a feature in the new version that you need, just switch back to Classic and it will be there. It is important that we hear from you about what you like or dislike about the new design. If you are finding something hard to use or confusing, please tell us. If you really want a feature that you are not seeing, please tell us. Of course, if you like everything you see, we like that too. Just click on the Feedback Tab on the left of the screen and enter your thoughts. We are all very excited about the coming months ahead. We have some amazing new features we are working on that will add more context to your mobile experiences, help you unlock new insights from your traffic, and much more. We thank you for your continued trust in ScanLife and look forward to hearing from you soon!